South Africa’s highly effective sevens system is increasingly serving to benefit the 15-man game, writes CRAIG LEWIS. In 2015, SA Rugby announced a new sevens strategy as part of the preparations for the Blitzboks’ involvement at the Olympics. With the aim of bolstering the team’s gold-medal ambitions at the Rio Games, a host of highly regarded fifteens players were brought into sevens consideration. Springboks such as Bryan Habana, Lwazi Mvovo, Francois Hougaard, Juan de Jongh and Cheslin Kolbe were all included in plans to build the strongest possible sevens squad to head to the Olympics. It was a strategy that never fully came to fruition as most of the fifteens stars fell by the wayside, but this also aptly reflected just how physically demanding the sevens system can be. Under the guidance of coach Neil Powell, the Springbok Sevens environment has become renowned for its dedication to elite conditioning and player development. It’s a family environment that fosters success and it’s no surprise that over the past two seasons, the Blitzboks have walked away as World Rugby Seven Series champions. 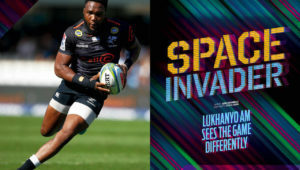 Springbok coach Rassie Erasmus has made no secret of the fact he holds SA Rugby’s sevens system in the highest regard. Even when appointing Mzwandile Stick as an assistant coach, Erasmus pointed out that it was his sevens background that would serve the Springboks well as they sought to develop players’ individual skills such as spatial awareness and off-the-ball work rate. Increasingly, highly regarded Blitzboks players are also beginning to make their mark in the 15-man game. The likes of KwaggaSmith (Lions), Dylan Sage (Bulls), Tim Agaba (Bulls), Seabelo Senatla (Stormers) and Ruhan Nel (Stormers) have all shifted their focus to play fifteens on a full-time basis for at least the next season. The talented Rosko Specman will be available for the first couple of tournaments in the 2018-19 series before taking up a two-year contract with the Bulls. Others, such as recently capped Springbok Sikhumbuzo Notshe, have utilised the successful system to hone their skills with the aim of bettering themselves as a fifteens player. Rather than heading into a regular pre-season with the Stormers before the 2018 season, Notshe took inspiration from other international loose forwards like Smith, Ardie Savea and Sean McMahon, who have all had success in fifteens and sevens. With this in mind, Notshe got the go-ahead to join up with the Springbok Sevens on a short-term basis, where he was able to focus on improving specific skills and his work rate. 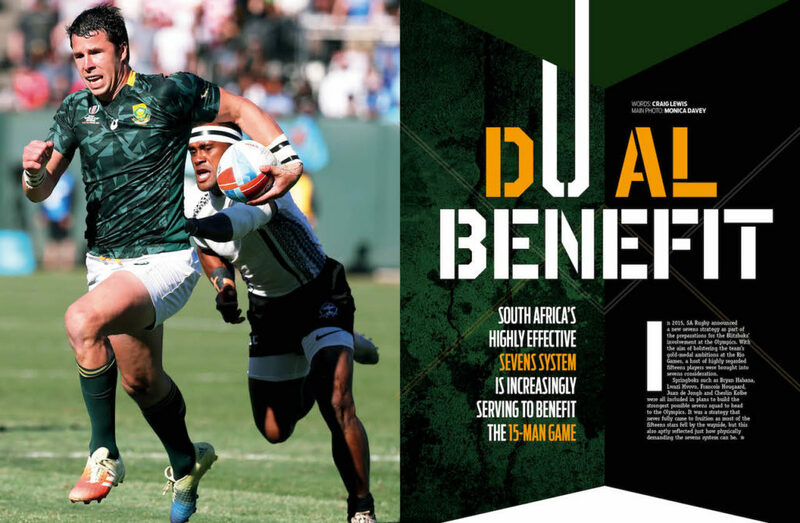 The 25-year-old tells SA Rugby magazine it was an experiment that paid dividends down the line, as reflected by his Springbok involvement during the June Tests and in the Rugby Championship. 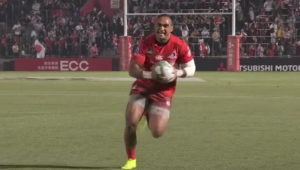 Towards the end of this year’s Rugby Championship, Erasmus further illustrated his willingness to consider sevens players for Test inclusion when he called up Nel without even a Super Rugby season under his belt. Although Nel didn’t receive an opportunity to make his Test debut in the Rugby Championship, the Bok coaches made no secret of the fact they were keen to have a closer look at the dynamic centre as they continue to build towards the 2019 World Cup. ‘If I compare Ruhan with one of the legends of the game, he reminds me of Marius Joubert, who was always sneaking around the field and had a real eye for space,’ Stick said. ‘That is something Ruhan possesses and his work rate also can’t be underestimated. 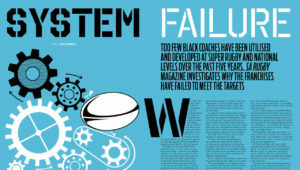 Indeed, it’s a credit to the Springbok Sevens system, where coaches such as Powell, Marius Schoeman, Renfred Dazel and consultant Dawie Snyman are nurturing a culture of success. Powell says he always believed sevens could be a stepping stone to fifteens for certain players. ‘When we started the sevens academy, we wanted to help players who had the ambition of playing fifteens and we’ve seen a number go on to achieve just that. The feedback we’ve received from fifteens coaches who have worked with sevens players is that they’re impressed with their urgency and work ethic. Of course, in sevens there’s a big focus on getting off the ground quickly and back into the defensive line. It’s about the intensity and urgency to stay in the game and to not think your job is done when you’ve just made a tackle. The nature of the sevens system also allows for coaches to address and assess what individual skills need to be fine-tuned on a player-to-player basis. It’s something that factored into the thinking of highly regarded former Junior Boks scrumhalf Marco Jansen van Vuren, who opted to leave the Lions and join the SA Rugby Sevens Academy in October. It’s not just in South Africa where this mutually beneficial relationship is being recognised. Before the November internationals, Wales coach Warren Gatland opted to include sevens star Luke Morgan. Besides developing players’ skills on attack and defence, there is also very little room for error in sevens, where the margins are so small. Notshe says it was something he came to appreciate very quickly. Ultimately, with a number of sevens stalwarts beginning to use this platform to branch out into fifteens, it means a rather inexperienced Blitzboks squad will head into the 2018-19 season. Nevertheless, the Springbok Sevens system has consistently proved it has the required structures in place to continue producing the next generation of players based on astute coaching, recruitment and effective succession planning. It all serves as a credit to a productive programme that has quickly become a vital cog in the SA Rugby wheel. 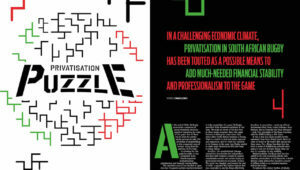 – This article first appeared in the December 2018 issue of SA Rugby magazine.